All subjects below have been identified and will be charged or have already been charged accordingly. Thank you. 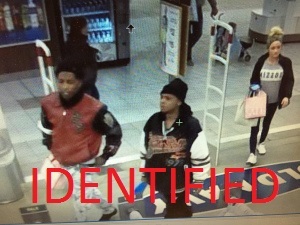 The Coralville Police Department is asking for assistance in identifying the following three subjects (black male, black female, white female) in regards to a counterfeiting incident this past weekend. If you have any information on the identities of any of the three suspects, please contact Iowa City Area Crime Stoppers to leave an anonymous tip. They were seen leaving the area in a newer style, mid-size gray SUV, possibly a Ford Edge.